All I saw was people behaving badly; from Baltimore's insanely liberal mayor to black talking head liberal operatives spewing idiotic excuses to domestic terrorist thugs turning the city into a war zone. I thought, I have seen this stupid evil horror movie before (Ferguson) and I “ain't gonna” watch it again. The media is reporting that some black leaders are calling for peace. Well, I am sorry, but that is too little too late. How do you expect black youths to react to the Left's orchestrated campaign to convince them that white Republicans and conservatives are racist and out to get them; white cops murder them at will, the rich got rich stealing from them and business owners are selfish and evil? Enough with this hogwash that Christians should not get angry. The bad behavior destroying peoples' livelihood in Baltimore and the nuanced response to it should make decent honorable people angry. The Baltimore riots and other incidents of black mob attacks and assaults on innocent whites across America are the result of the Left's hoax that blacks are victimized in America; perpetrating hate for political gain. Such evil should make decent Americans angry. Equally frustrating is that all the black outrage, anger and violence is based on lies. For example. It has been proven that witnesses lied about Michael Brown after robbing a Ferguson convenience store and assaulting the clerk had his hands up in surrender to police. Brown was shot while attacking a police officer. And yet, from the Grammy Awards to pro football players running out of the tunnel with their hands up, the lie, slander of America's police and hatred was furthered and nurtured. 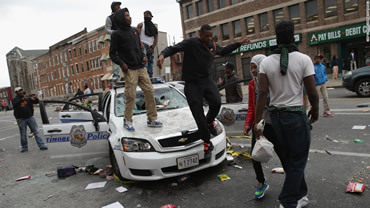 If the mayor of Baltimore and liberal media are going to take a don't-make-the-black-kids-angry approach to dealing with white bystanders being brutalized, businesses being destroyed, looting and chaos in the streets, there is nothing I can do about it. Someone said voters get the government they deserve. Baltimore is notorious for electing liberals.